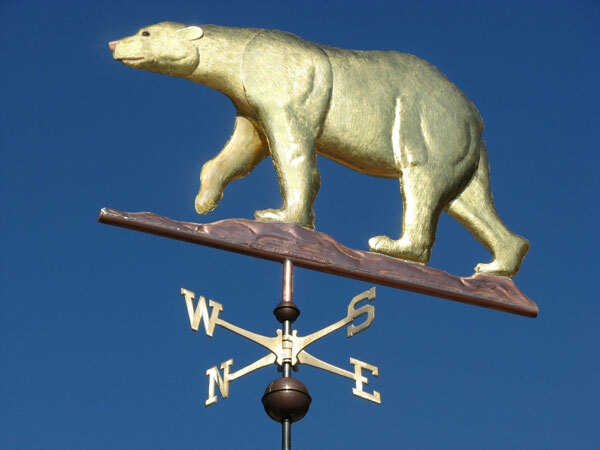 Our Polar Bear Weather Vane, Ursus maritimus, comes gilded and has brown glass eyes with black pupils to give it an animated and lifelike appearance. The gold leaf, normally an option on other weathervanes, is included in the price of this weathervane*. West Coast Weather Vanes offers several different polar bear designs including one showing a polar bear stealthily stalking a harbor seal. 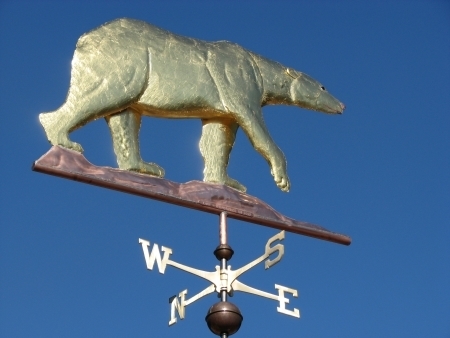 We have had orders for this Polar Bear Weathervane from some interesting people. One customer annually heads to Northern Canada to do polar bear studies. Another was a surprise birthday present for a geologist who works near Churchill, in northern Manitoba. Churchill is famous because polar bears congregate there each fall waiting for ice to form on the Hudson Bay. Another customer has their polar bear vane mounted on their home in Texas! Most of our Polar Bear weathervanes have been fabricated in the larger sizes and were designed to go on top of homes or garages. However, we have made other bear weathervane designs in the small size and, I must say, the small vanes have a special charm all their own. Whether you mount it outside on a fence post or display it indoors on a bookcase, its luminous golden coat attracts your eye. 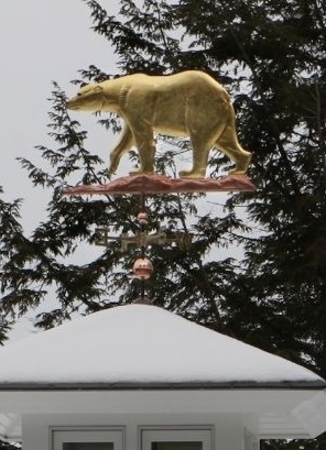 So, if you know a polar bear aficionado who has an extensive collection of polar bear themed objects, making them hard to shop for, it’s a good bet that they don’t yet have a polar bear weathervane. For that special occasion, be it a birthday or anniversary, the inclusion of ‘lucky’ pennies’ is one more way to make a unique gift something truly memorable. * Because the cost of gold leaf fluctuates frequently, it is possible that the price for this weathervane could go up or down based on current market conditions. Please verify pricing with us prior to placing your order.